PlaidServe is a mobile app that helps organizations and individuals measure and communicate their social impact. By tracking an individual’s service, our app is able to produce compelling infographics for marketing and communication purposes. Our product is geared towards colleges, non-profit entities, and Greek organizations, all of which can benefit by demonstrating their social impact. The idea is simple. While users are doing good, PlaidServe lets them use their mobile to report and measure their service. Simple integration with social media lets you leverage users’ personal networks to promote organizations and causes. Current technology makes it cumbersome for organizations to track, verify, and effectively communicate social impact. We replace manual and clunky automated processes by leveraging social media and providing more effective communication faster and at a price point that is achievable for most organizations. PlaidServe allows users to easily check-in to service sites and log volunteer hours in real‐time. Users can document location, duration and a description of their volunteer experience. Hours can be verified both through our GPS check-in and email confirmations with volunteer supervisors. Social networking connects users to each other and to the broader service community. Users can invite friends to service opportunities, see where their friends are serving and join in, and challenge other student organizations to do service. Integration with social media sites helps each of your users become an agent of change. Users will help you tell the story of the work your organization is doing in the community. Encourage others to explore ways of positively affecting their communities by creating space for your organization to publicly model a culture of service. Send calendar invites for service opportunities to your entire group. Users can accept/decline invitations for easy attendance tracking. Admin can modify events and send updates to attendees. Event participants receive periodic reminders and updates about upcoming projects on their calendar. Build service into your organization’s branding, marketing and communications. Our administrative dashboard aggregates and organizes all your service data and generates a visually compelling service report. 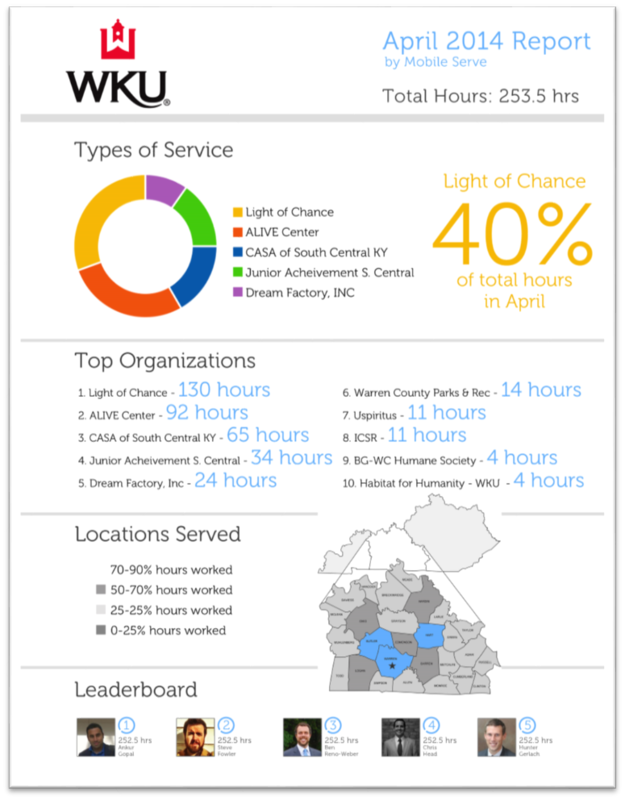 Tell the story of your organization’s service by displaying the data your audience is most interested in: total hours served, types of service completed, areas and populations reached.